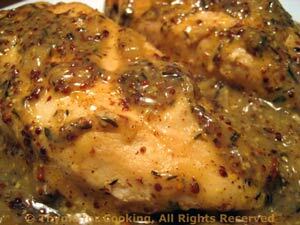 Chicken with Whole Grain Mustard Sauce, Thyme for Cooking gourmet menus. An easy dinner to end the week. And, yes, one can have winter salads.... This should finish the cauliflower. Put an inch of water in the bottom of a steamer and put it on medium-high heat. Cut potatoes into large bite-size chunks and put into the steamer. Cut cauliflower into florets, put on top of potatoes. Steam for 10 - 15 minutes, until fork-tender. Remove from heat and drain water from pan. Return pan to heat and add oil. Add herbs, mustard and vinegar, heat through. 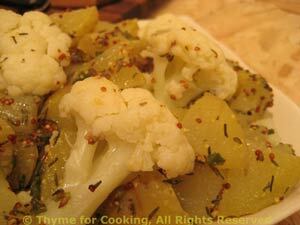 Add potatoes and cauliflower and toss well to combine. Serve.